Quick Search: Hit CONTROL-F to search this page directly with your browser! CLICK to see the Oughtred Society Slide Rule Reference Manual Preview! The First Edition Oughtred Society Slide Rule Reference Manual is now available. Click on the logo above to see the details, and order your copy. Richly illustrated with 97 color photographs, it is suitable for everyone from new beginners to long time collectors. There are only 1,000 copies in the press run, so don't miss out on a chance to get this incredible illustrated reference. Need a good manual and introduction to slide rule operation for that new user? 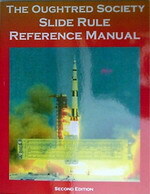 Add the newly printed Oughtred Society Slide Rule Reference Manual to any rule below for an additional US$35. Loaded with great information and color photographs, an ideal way to interest that new student. Mannheim (or Simplex) Slide Rules, which have a single-sided cursor and one main operating surface, with sliding and stationary scales. K+E, Aristo, Faber-Castell, Acu-Math, Sterling, Post and Hemmi often added inch/mm scales along the outer edges of these rules, since they normally lay flat on desk, and can also conveniently serve as a conventional ruler. This type of rule is held together by the continuous back surface, which joins the two stationary scale bodies. Original Mannheim rules had only A, B, C & D scales, but many later models added a reciprocal scale (CI), a cube scale (K), and on the slide reverse, T, L & S cales. Unfortunately, the cursor can usually be slid right off this type of rule, making it very easy to loose, especially when slid into its case. Some later rules incorporated edge 'keepers' to prevent the cursor from accidentally disappearing. Duplex Slide Rules, which have a double-sided cursor and operate on both surfaces, with sliding and stationary scales. This type of rule is hand held to operate, and usually has additional reciprocal scales (CI & DI), as well as folded scales CF & DF. More complex examples add Log scales of various sorts, more trig scales, and sometimes special purpose scales like Sq1 and Sq2. These rules must be held together with rigid aligning end pieces (usually metal) that keep the stationary scale bodies joined, and fortuitously also prevent the cursor from sliding right off the rule, and into deep space. There is an unsubstantiated rumor that the rings of Saturn are composed largely of missing slide rule cursors, and lost airline luggage. Who can say? and Circular Slide Rules, with stationary scales routed on a circular surface (to give greater effective scale length without poking into the workspace of the adjoining desk), and using dual movable cursors, or sometimes another rotating disk and a single cursor. Variations of this design may be anchored to a flat back piece (with rotating circular scales), or may have secondary rear functions. These can be either simplex or duplex rules in terms of over-all design. The principal reason for circular construction is to give longer scale length (and hence higher resolution and accuracy) in something that is still hand held and convenient. Over and above these mechanical distinctions, there are many trade name types, such as "Deci-Lon" (refers to the Decimal trig and Ln or "LON" scales), "Log Log or VersaLog" (refers to the presence of expanded Log scales), "DeciTrig" (refers to the presence of Trigonometric related scales with decimal increments), VersaTrig, and so forth. The sometimes get combined together in mouth twisting marketing combinations like: "Duplex DeciTrig", "Duplex Log Log", "Duplex DeciTrig or VersaTrig", "Polyphase",and similar overwhelming descriptions. Early rules were made of hardwood (usually mahogany), with a few made in brass. Early Sun Hemmi rules (also marketed as POST and several other brands) made in Japan were made of Bamboo, with a celluloid white covering for marking. This celluloid covering is frequently mistaken for 'ivory', which it is not. No modern make (after 1890) used ivory, and it is very uncertain if there are actually any ivory slide rules from any maker, but it is possible prior to 1890. Bamboo as a core material has some unique characteristics, such as exceptional dimensional stability under changing humidity and temperature, and is intrinsically self-lubricating: the near ideal slide rule body material. K+E, Dietzgen and other US and European rules used mahogany wood bodies, covered in similar white coatings for clarity of marking (usually by engine dividing/engraving). Pickett was one of the few to manufacture in aluminum (and initially magnesium), with a painted surface in white or their distinct trademark "eye saver" yellow color. Many lower cost rules in later years were made of plastic of one sort or another (usually PVC), and K+E eventually moved to its trademark synthetic material (Xylonite), and then later to "Ivorite" with the introduction of the 4181 in 1955 and 68-1100 "Deci-Lon" series by 1961. Cursors (also known as indicators or hairlines) were made of glass originally, usually with a metal carrier, and then were later implemented in acrylics and other plastic materials, which while not as scratch resistant, were often far less breakable. 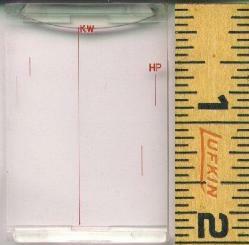 Plastic cursors (like the Staedtler-Mars 544 cursor pictured at left) often have multiple hairlines which give automated conversion between units like KW and HP, and circle area calculation. Some high end rules incorporated glass magnifying cursors, which greatly improve the ability of the user to set finer increments on the scales. Earlier generation slide rules, with heavy wooden core bodies, and solid glass cursor faces are often somewhat magical to hold, as they have a heft, warmth, appearance and feel that is quite unique, and very satisfying to use. Many of the most popular rules like the K+E 4081-3, and Post 1460 Versalog, are made in this way. Slide rules are based on adding and substracing logarithmic distance relationships through positioning the slide and body, and as a result, can multiply, divide, take roots and powers, calculate logs and a wide variety of trig functions. They cannot add or subtract, (although you certainly could if the rule had multiple L scales which have linear distances) and they require the user to keep track of the decimal point/order of magnitude in his or her head. They are very good for quickly solving complex formulas, especially those with many multiplied or divided terms, and visually reveal ranges of answers in a way that calculators cannot do. The essential accuracy of a slide rule is generally three significant figures over a very wide dynamic range. This accuracy is more than adequate for many engineering decisions and calculations, but it is not ideal for computing moon shots. It is worth mentioning however, that many bridges, buildings, basic and advanced electronic designs, and space ballistics work was done with nothing more advanced than an ordinary 10" slide rule. IN FACT, there is some rocket science here, as Pickett rules were carried (and presumably used) on three Apollo Space Missions, a fact that was loudly advertised on some Pickett boxes. We will assume they were not used to swat space flies, and had some real merit, as every payload ounce was very precious. You could calculate exactly how precious, if you had one. Werner von Braun's favorite was a Nestler slide rule, that he used during his career at NASA. Determining just what slide rule you have is sometimes fairly complicated, due to the rather modest way in which manufacturers marked their products. Most rules have a part number and manufacturer's mark or logo, but locating and recognizing them takes a bit of practice. We have put the logos here for major makers (K&E, Pickett, Post, Sun), but there are also many additional makers, such as: Acu-Math, Sterling, Diwa, Unique, Hoffman, Aristo and others. In general, model numbers were three or four digits (see the archives for details), and often had suffixes or post-fixes that added additonal information like color or size. Check side edges of the body and cursor for more data, and if you find matching digits or parts of digits on the slide and body parts, keep in mind these are NOT the part number, but rather matching numbers for production assembly. Sun and Post numbers are clearly marked (No. 1447, for example), K&E model numbers are just there, like 4053-3, in almost any location from the end of the slide to the side edge of the body. Pickett numbers are very clearly marked (Model no. 1010ES) on the left side of the slide. Other makers fall in between these considerable extremes. The type and condition of a slide rule, along with it's accessories play a big role in determining value. In theory, every slide rule came in some kind of original packaging, usually a distinctive long box for higher end rules, and some kind of plastic pouch for low end rules. Having the packaging, especially in good condition, adds considerably to the value of a slide rule to a collector. Virtually all slide rules also have a protective case for everyday use, leather is at the top of the case heirarchy, descending to various types of plastic and cloth. A rule missing the case has less value, and is more likely to be damaged, than a complete rule and case set. Most rules also included an original manual, which may be only a few pages, sometimes wrapped around the rule in it's case, to an extensive and well illustrated book. Again, having this with the rule increases it's value, although these are frequently separated, and after a long time, rarely appear together. Things that significantly detract from a rule's value are a broken or missing cursor, visible scale damage, warping, chipped surfaces, scratches, owner's marks or other writing on the case or rule. Original prices for many rules were often low in terms of absolute dollars. Catalog prices of $1.00 to $15.00 were not uncommon, and I know of at least one example at only 30 cents, but adjusted for inflation (after 20-90 years) in today's dollars, they would often have values of $50-$150, not considering any collectable value. Used rules are often available for between US$30 and US$50 with some dilligent shopping, and complete new packages go for twice or more of that amount. Unusual rules, such as longer (20") or compact rules (5") often fetch higher prices, and it is unusual to see 20" rules sell below US$100, regardless of condition. Value is largely in the eye of the purchaser, and if you feel the rule is worth it, for reasons important to you, that will determine the price you are prepared to pay. Rules that fetch the highest prices are generally K&E, POST, or Pickett. Some people favor other brands like Faber-Castell, Unique and Dietzgen. Rules with the lowest market value are usually plastic rules like Acu-Math or Sterling. On a totally PERSONAL level (just my silly opinion, nothing more), I like the older K&E rules, the newest K&E Deci-lon rules, and some later and larger Hemmi, Post and Faber-Castell rules. My personal favorite? The Faber-Castell 2/83N Novo-Duplex rule, you can see it here. I just can't get excited about Pickett, except for some of the smaller ones, which have high gadget value. Pickett remains very popular (despite me and my indifferent attitude), especially with engineering and electronics types. This is puzzling, since I am one of those guys, but there you go, an amazing mystery. The official instructions packed with new POST rules say only mild soap and water, no harsh detergents or solvents. I found warm water, or warm water mixed 1:1 with Windex works GREAT, and really restores the rule surfaces with only mild rubbing. Thin to 5:1 for Pickett rules, to avoid any paint damage on the scales. To be sure the Windex will not affect your rule, take a small amount on a Q-tip, and rub a back corner or slide spot usually under the side braces. After it dries, and if it looks ok, and doesn't streak the markings, you can do the slide. Continue if results are good, and clean the slide rails inside and the body. Very cheap, old painted wood rules may be damaged by any liquid applied to the surface, so be cautious. I cleaned a horrible N4053-3 that was so bad, the numbers were filled with dirt and grease, and the cursor was streaked and scratched from rubbing the dirt underneath. The rule surfaces were badly streaked and largely unreadable, and in general, looked BAD. Gentle rubbing with a soft rag wetted with Windex restored all the surfaces and the cursor, and left the filled marks intact. I also used it to clean the slide surfaces and tracks on the rule body. The result? A vastly improved rule, which turns out to be quite lovely when all the accumulated grime is gone. The patent date was June 5, 1900, which was just a smear when I started. The factory approved way to clean K+E rules is to use steel wool (I use a scotch-brite pad), and to rub the scale surface to remove any dirt or grime. Works great (on K+E, Hemmi, FC and Post engraved scales), but DON'T do this to a Pickett rule, or it will be destroyed. Not for the faint of heart. NEVER soak any wood parts (body or slide) in water, but the cursor can sometimes be greatly improved with a soak in warm windex and water to get out all the stubborn worked in dirt. Most instructions clearly say no lubrication (especially oil or grease) on the slide or body tracks. Avoid letting dirt accumulate there, as it makes the rule hard to move, and increases wear. Click to visit! Buy a slide rule from our extensive on line marketplace, with restored classics, amazing new in the box rules, and low cost first student rules. We have something for everybody, even a swap and sell area for visitors. Click to visit! 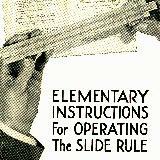 Learn to operate and care for your slide rule with these on line manuals and directions. Learn what scales mean, how to use them and how to restore or keep your rule in good condition. Click to visit! Tour our extensive archives of slide rule manufacturers and models from all over the world. Find out who made what, and what became of them after they stopped making slide rules. See how slide rules survive today in the form of slide charts still made in the millions annually. Click to visit! Visit other slide rule places on the web with more slide rule data and information. From personal collections on line to (yes, it's really true) the international slide rule owners and collectors organization, the Oughtred Society. Click to visit! Nice things people have said about us in print and on TV, see the original articles. We always appreciate it! Click to visit! Visit our TEST EQUIPMENT site everything from Scopes, CRT's and DMM's to nixie tubes, HP and Tektronix spare parts. A little electronic something for everybody. E-mail us You are visitor number . Site Design & contents copyright 1997, 1998, 1999, 2000, 2001, 2002, 2003, 2004, 2005, 2008, 2013 by Walter Shawlee 2 & the ad hoc Godzilla Graphics Group.